Beginning January 2008, UGA Costa Rica launched its Carbon Offset Program, an effort uniting the university’s study abroad campus with the San Luis community to offset carbon emissions through reforestation in the Monteverde and Bellbird Biological Corridor region. Visitors, including researchers, faculty, students and tourists, participate in the program by purchasing carbon offset certificates, working in the nursery and visiting local farms. 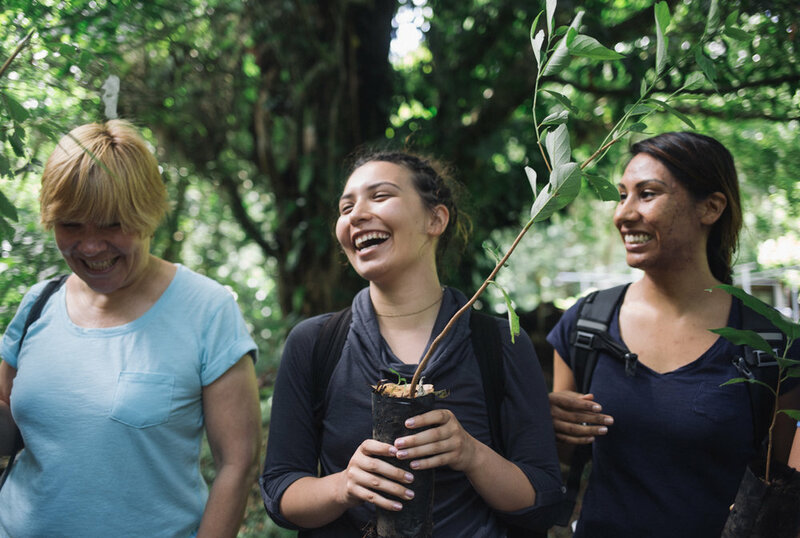 On average, a student participating in a UGA Costa Rica study program releases 0.66 tons of CO2 during their travels to and through the country. We plant four trees per person to offset these emissions, taking into account an estimated mortality rate of 25 percent. In addition to offsetting carbon emissions related to visitor travel, this project helps restore critical habitat loss on degraded pasturelands where tropical rainforests once stood. 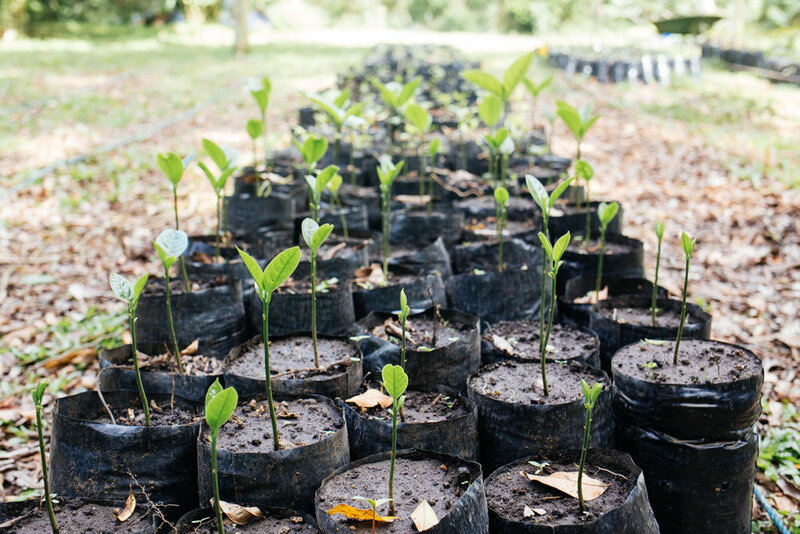 The UGA Costa Rica Carbon Offset Program establishes long-term research forests in which University of Georgia scientists and international researchers study the effects of climate change. The Bellbird Biological Corridor where we target these reforestation efforts forms part of the Mesoamerican Biological Corridor, which stretches from southern Mexico through Panama. The UGA Costa Rica campus general manager, Fabricio Camacho, serves as the President of the Advisory Committee for this corridor, which is recognized by the Costa Rican government as part of the country's national biological corridor program. Carbon offset purchases through the UGA Costa Rica Carbon Offset Program directly benefit the three-wattled bellbird, the flagship species of this corridor, as well as the resplendent quetzal. These two migratory species act as symbols of Costa Rica’s ecotourism industry, enticing visitors from all around the world. They are greatly impacted by habitat loss in this region, making reforestation efforts essential to their persistence. In addition to planting trees on campus, our goal with the Carbon Offset Program is to engage local landowners as part of a carbon neutrality solution by developing market-based incentive programs. This approach provides income for reforesting degenerated pastures and protecting existing forests on their farms and helps keep farmers on their own land by generating new sources of income from ecosystem services. Ultimately, we believe this effort keeps rural families and communities together while building sustainable rural economies. Students who visit UGA Costa Rica as part of study abroad programs receive certificates reflecting their carbon offset purchases, which are included in the program fees. Visitors assist Lucas Ramirez, a native plant and reforestation expert, to prepare tree seedlings, plant trees at local farms and participate in lectures with UGA Costa Rica staff about the Bellbird Biological Corridor. Fabricio Camacho C., General Manager & Associate Director, University of Georgia Costa Rica Campus. The UGA Costa Rica Carbon Offset Program partners with the Fundación Conservacionista Costarricense (FCC), the Tropical Science Center (CCT), the Monteverde Conservation League (MCL), and the Costa Rican government’s System of Conservation Areas (SINAC) and Ministry of Environment (MINAET), among others. Faculty and Administration from the Warnell School of Forestry and Natural Resources and the Odum School of Ecology, both at the University of Georgia, provide administrative and technical guidance for the UGA Costa Rica Carbon Offset Program. We charge 25 dollars per carbon offset certificate to cover the operating expenses of the program. This fee includes the labor involved in collecting seeds from native species in the forest, bringing them to the nursery for cleaning and germination and caring for the seedlings for six months to one year for each individual tree. In 2016 alone, we have planted 2,914 trees through the UGA Costa Rica Carbon Offset Program. This brings our program total to 39,723 trees planted on UGA Costa Rica property and throughout the Bellbird Biological corridor since the program’s inception.